"Blindsnakes are not very pretty, are rarely noticed, and are often mistaken for earthworms," admits Blair Hedges, professor of biology at Penn State University. "Nonetheless, they tell a very interesting evolutionary story." Hedges and Nicolas Vidal, of the Muséum National d'Histoire Naturelle in Paris, are co-leaders of the team that discovered that blindsnakes are one of the few groups of organisms that inhabited Madagascar when it broke from India about 100 million years ago and are still living today. The results of their study were published in the 31 March 2010 issue of the Royal Society journal Biology Letters. Blindsnakes comprise about 260 different species and form the largest group of the world's worm-like snakes -- scolecophidians. These burrowing animals typically are found in southern continents and tropical islands, but occur on all continents except Antarctica. They have reduced vision -- which is why they are called "blind" -- and they feed on social insects including termites and ants. Because there are almost no known fossil blindsnakes, their evolution has been difficult to piece together. Also, because of their underground lifestyle, scientists have long wondered how they managed to spread from continent to continent. In this study, the team investigated the evolution of blindsnakes by examining the genetics of living species. They extracted five nuclear genes, which code for proteins, from 96 different species of worm-like snakes to reconstruct the branching pattern of their evolution and allow the team to estimate the times of divergence of different lineages within blindsnakes using molecular clocks. "Our findings show that continental drift had a huge impact on blindsnake evolution," explains Vidal, "by separating populations from each other as continents moved apart." Mutations in the genes record the history of these blurry-eyed serpents. The genetic research reveals that the original stock of worm-like snakes arose on Gondwana, the ancient southern supercontinent. The initial split occurred about 155 million years ago as Gondwana divided into East Gondwana (the landmasses of Antarctica, India, Madagascar, and Australia) and West Gondwana (the landmasses of South America and Africa). The residents of East Gondwana -- the blindsnakes -- then diverged into several lineages including a new family named in this study and found only on Madagascar. Later, East Gondwana further divided into a new paleolandmass -- called by the researchers "Indigascar" (India plus Madagascar) -- and another comprised of Australia and Antarctica. The research suggests that the new family on Madagascar arose as a result of the break-up of the Indigascar landmass about 94 million years ago. Madagascar's long isolation has led to the evolution of many unique endemic animals including this family of blindsnakes, various lemurs, and other rare mammals. Unfortunately, both the animals and plants of Madagascar are now endangered by habitat loss. Says team member Miguel Vences, a professor at the Technical University of Braunschweig, Germany, and authority on the biodiversity of Madagascar, "Finding such ancient roots for a group of animals in Madagascar gives us even more reason to protect their rapidly declining habitat." If blindsnakes got their start on Indigascar, leaving an endemic living family as evidence on Madagascar, how did they get to all of those other places in the world that they occupy today -- Europe, Asia, Australia, Africa, and the Americas? The phylogeny constructed by the Hedges and Vidal team shows a series of diversifications within the blindsnakes, outside of Madagascar, that occurred between 63 and 59 million years ago. The period of greatest diversification coincided with a time of low sea levels, when connections between continents were forming and the dispersal of such unlikely animals by floating on flotsam was easier. Blindsnakes must have moved either out of Africa via Europe and Asia -- the ancient northern supercontinent Laurasia -- or out of India and then from southeast Asia to Australia at about 28 million years ago. 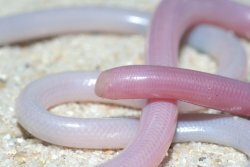 Since there were no land connections between Asia and Australia at this time, these blindsnakes could have reached Australia only by crossing the ocean on floating flotsam. After that point, the splits within the blindsnakes probably occurred because they were following the evolution and spread of their prey -- ants and termites -- in various geographic regions. Floating across oceans seems an unlikely mechanism for a burrowing animal to spread to new continents, but there is a second instance of ocean crossing by blindsnakes among the groups left on West Gondwana: West Gondwana broke up about 100 million years ago, making Africa and South America separate continents, but the genetic split between African and South American blindsnakes occurred only at about 63 million years ago. This finding shows that blindsnakes probably were confined to Africa when West Gondwana broke up and only later traveled to South America -- and still later to the West Indies -- by floating across the Atlantic from east to west. This journey has rarely been documented. Only six or seven other vertebrates are thought to have crossed the Atlantic in a westward direction. However, the crossing would have taken no more than six months and might not have been too difficult for blindsnakes, which have a relatively low need for food and may have been floating on vegetation rafts along with their insect prey. "Some scientists have argued that oceanic dispersal is an unlikely way for burrowing organisms to become distributed around the world," observes Hedges. "Our data now reinforce the message that such 'unlikely' events nonetheless happened in evolutionary history."